Serve these well-seasoned pork chop and rice meal with the optional frozen peas or use your family's favorite vegetables. Whether you use the crock pot or make it faster in your trusty skillet, the dish will not disappoint. Pat the pork chops with paper towels to dry. Sprinkle with kosher salt and freshly ground black pepper. Peel the onion and cut it into 1/2-inch pieces. Toss the pork chops with flour. Heat the olive oil in a large skillet over medium-high heat. When the oil is hot and shimmering, add the pork chops and brown for about 2 to 3 minutes on each side. Remove the pork to a plate and set aside. Add the chopped onions to the skillet; continue to cook until onion is translucent. Add the garlic and cook for 1 minute longer. Place the rice in the slow cooker and then sprinkle with parsley. 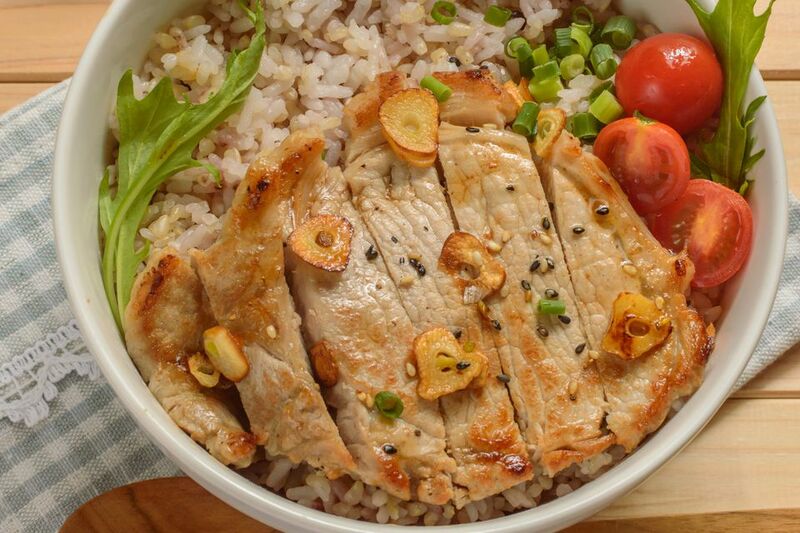 Arrange the pork, onions, and garlic over the rice. Pour the chicken stock into the hot skillet and stir to loosen the browned bits from the bottom of the pan. Pour the broth over the pork and rice in the slow cooker. Cover and cook on low for about 4 to 6 hours, or until the rice is tender. Add the thawed green peas about 30 minutes before the dish is done (if using). Follow steps 1 through 6, above. Add the rice and parsley to the skillet with the onions and top with the pork chops. Add the chicken stock to the skillet along with 1/2 cup of water or more stock. Bring to a simmer over medium-high heat. Turn the heat to low and simmer for 20 minutes, or until the rice is tender. Add the frozen peas about 5 minutes before the dish is ready (if using). You can cook the rice separately if you'd like. Cook it on the stovetop about 25 to 30 minutes before the pork is ready. Add about 1/2 cup of the chicken stock to the pork in the slow cooker and cook the rice in a combination of the remaining 1 1/4 cups of chicken stock and 1 1/4 cups of water or more stock.